This is a 4-night and 5-day workshop. Your adventure begins at 11 a.m. on July 8 and ends after a final slideshow on the afternoon of July 12. $1,450 + applicable taxes. Register below. Balance of $950 due on April 9, 2019. Last day for a cancellation request is April 8 (see cancellation and refund policy). This workshop begins during the waxing crescent moon (only one day before first quarter), and will appeal to photographers interested in using gentle moonlight to bring out landscape details with some light painting closer to the camera. 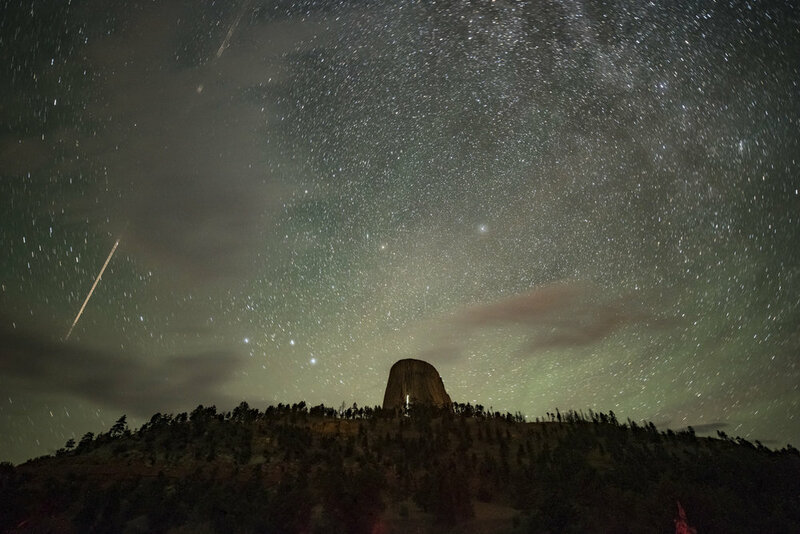 The workshop will explore the sometimes electric mysteries of the stone tower; the deep, dark skies surrounding it; and the landscape that encompasses this geological mystery. And no, there are not roots below it. 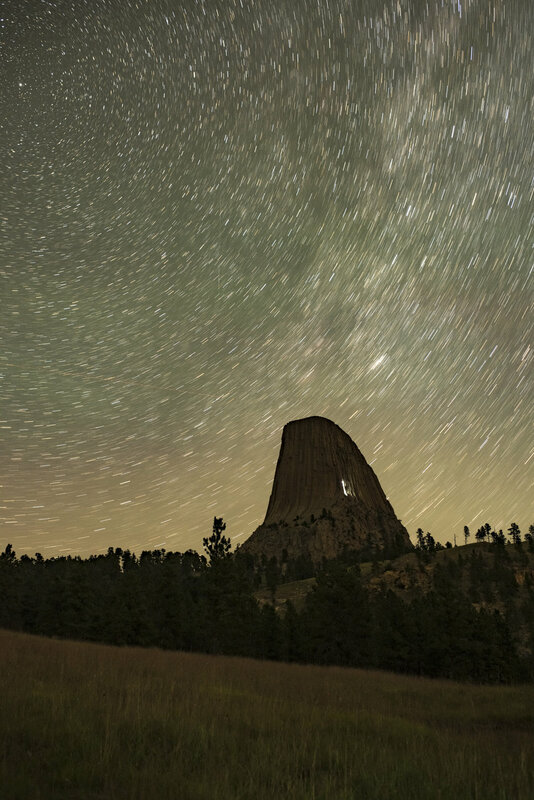 Devils Tower is nestled among the prairies of the Black Hills in northeastern Wyoming. It has remarkably dark skies, and views of the tower from all sides, far and near. This includes prairie and forest views from many sides, as well as an up-close view from the paved trail circumnavigating the base of the formation. 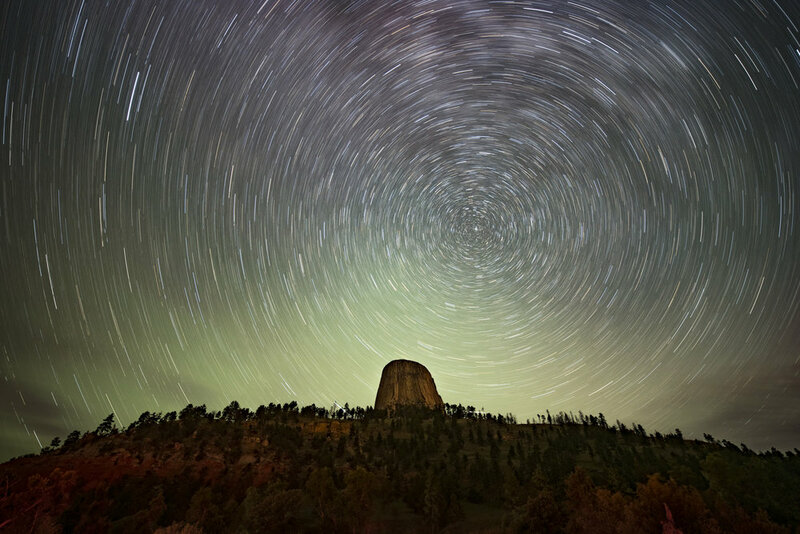 All of these elements combine to make Devils Tower National Monument a must-visit park. It’s a powerful place steeped in ancient tales connected to the stars and Earth—ideal for night photography. The workshop will also make a visit to photograph Mount Rushmore National Memorial, where the presidents of the past gaze forever over the country they helped found and preserve. 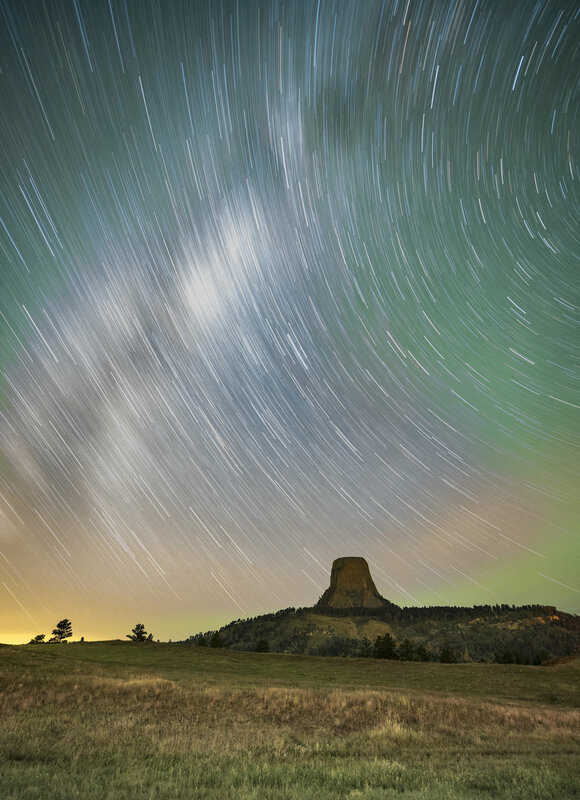 Surrounded by the beautiful Black Hills, the cliffside figures are a sight to behold, and will serve as unique night photography subjects. We hope to push you to step outside your comfort zone—to test the limits of what you and your camera can do. You’ll go home after the workshop with a solid grasp of night photography in a moonlit environment, and a good foundation in light painting techniques. Our locations have generous room to explore, so everyone will be able to spread out and not get in one another’s way. Each participant will have the opportunity to work one-on-one with Chris and Matt in the field. The workshop will be based out of Hulett, Wyoming. You are not required to stay at the official workshop hotel, though doing so does make it easier to meet with the group each morning. Booking info and a group code will be sent after registering. It’s summer in Wyoming. The weather is usually warm during the daytime and mild during the evening. Daytime temperatures often reach the 85 F on average. A mild 51 F at night is common. July averages six days of rain for the whole month, but we’ve loved the late afternoon and evening thunderstorms combined with open prairie skies. So plan accordingly and check the weather while packing for your trip. Recommended attire: We’ll be spending much of the daytime at the hotel with some late afternoons in the park, so we’ll probably avoid rain. Wearing long pants is advisable, but shorts and a T-shirt are great too—especially if you bring some light layers to add as the evening draws on just in case it gets cooler than normal. We suggest bringing a rain parka and even rain pants, as well as waterproof trail shoes, just in case a storm system blows through. You will be thirsty. Please stay properly hydrated. We suggest drinking at least a gallon of water each day. Start at home a week or two before the trip so your body is prepared to retain that amount of hydration. The Devils Tower gave me the feels. That’s the only way I can describe it. I’ve never visited a natural location that has ever made the hairs on the back of my arms stand up—not in fear, but in awe. Long before Steven Spielberg made the location world-famous, the indigenous peoples and tribes in the area used it for winter camps, vision quests, fasting, praying and burial. 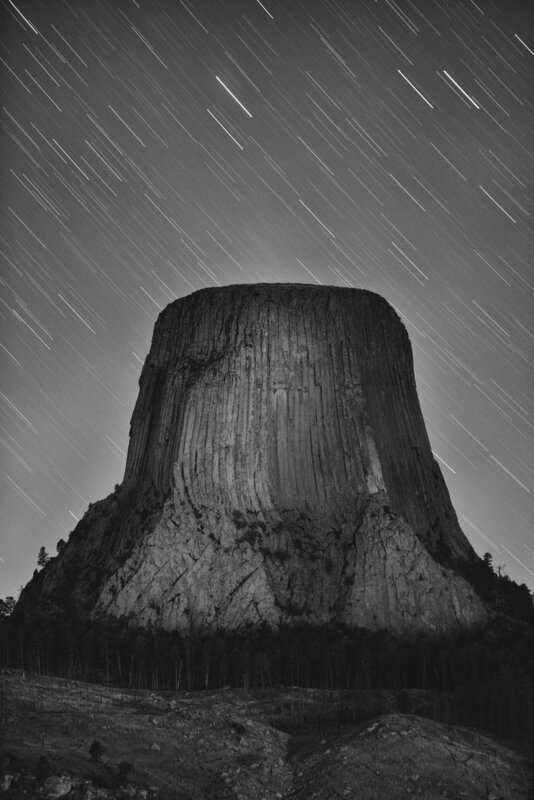 I read the enchanting and heart-breaking oral histories about the Devils Tower. It’s holy. Revered. Sacred. And a focal point for gathering, for worship and for a way of life that has passed with the coming of other cultures. 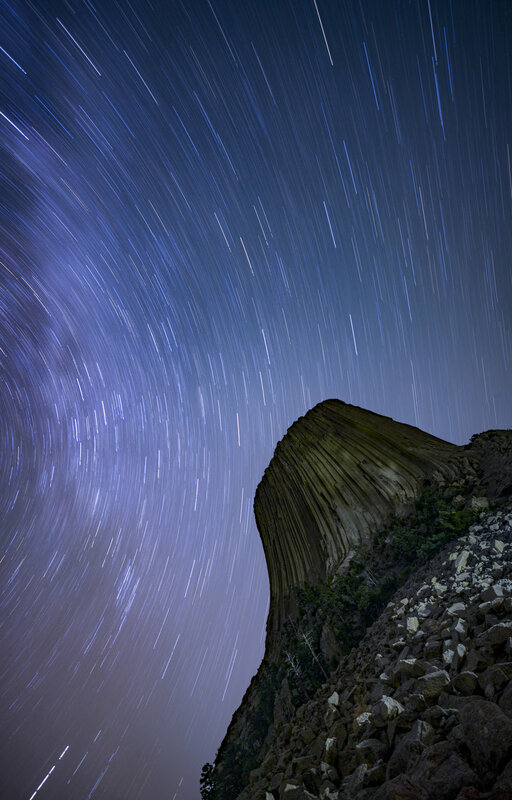 And as we sat under the stars the first night, observing the tower, I noticed a speck of light on the formation. It was a small group of crack climbers who were descending during twilight well into darkness. With headlamps. And they illuminated their path down the tower during our image sequences. What a wonderful surprise. On another night, we had a broad view of the prairie, the tower, a lightning storm and the MIlky Way. All in one frame. Again, magic. On another night, I volunteered to light paint the tower from the base. So I grabbed a radio, drove up to the base and walked the trail halfway around the tower. As I walked around the formation, I felt a presence. Perhaps I was thinking too much about bears (I do that …), but this was something I usually do not feel. I was alert and focused. And there was something ineffable that I still cannot put my finger on that lingers to this day. Join us and find your own connection to his geological and spiritual marvel. It’s an experience you’ll likely never forget.